On May 18, 1989, an estimated one million Chinese protestors swarmed Tiananmen Square and the surrounding streets of Beijing demanding a democratic system of government. It was the largest popular demonstration in the 40-year history of communist China. Student-driven protests calling for democracy had begun in China a month before but ramped up considerably when Soviet leader Mikhail S. Gorbachev arrived in the country for an official visit. Many of the protestors were on a hunger strike, and when they had to be hospitalized, new recruits stepped in to take their place. 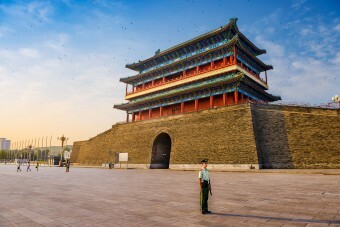 Gorbachev’s planned visit to Beijing had to be scrapped, along with a proposed trip to the Peking Opera at the Great Hall of the People, as both venues border on Tiananmen Square. However, he did manage to sneak a peek at the iconic Great Wall of China an hour away. Though there was no love lost for Deng and Li, most praised the initial restraint shown by the government, mainly credited to Communist Party boss Zhao Ziyang. But there was a widespread outcry against the country’s leadership for their inability to take the situation in hand. They continued to stall and ignore the protestors demand to be recognized as a patriotic movement and their request for a dialogue on needed reforms. Tragically, though perhaps not surprisingly, the situation worsened quickly over the next several weeks. Fearing they were losing control over things, the Chinese government began responding to the protests going on in cities across the country with increasingly harsher methods. Police began beating and arresting protestors, and that was only the beginning. On June 3, 1989, Chinese armed forces were ordered to storm Tiananmen Square and clear it by force. As the protestors were brutally swept away, thousands of people were killed in the process. Around ten thousand more were arrested. The event has come to be known as the Tiananmen Square Massacre, and in the west, the Chinese students were revered as freedom fighting heroes. How Do the Media and Police Estimate Crowd Sizes?